House Arc may look like an egg-shaped antidote to McMansion mania, but this small mail-order home was really designed as a way to quickly provide housing to victims of disaster. "We wanted to see how we could produce a house that would fit into a flat packing container that could be shipped to communities in need, like New Orleans after Katrina," said architect Joseph Bellomo, who worked on the modular home for 2½ years. The result was House Arc, a 150-square-foot structure of hollow steel tubes. Not only can the 3,000-pound modular home withstand high winds, it can also be boxed into a 120-cubic-foot freight container and shipped off to its next destination. House Arc is designed to be put together like a piece of Ikea furniture, according to Bellomo. In other words, anyone with moderate carpentry skills should be able to assemble it. If the home is no longer needed, it can also easily be taken apart and shipped somewhere else. The curved design is so strong because it works like an arch, spreading the weight of any load, such as the pressure of a strong wind, across the surfaces rather than allowing it to concentrate on one spot. For Bellomo, it was important for the home to be practical yet also attractive. Disaster victims are often relegated to substandard housing conditions, packed into trailers or even tents for months after they lose their homes, he said. Bellomo was inspired to create the modular home after he made Bike Arc, a steel-arched shelter that riders could lock their bikes into. Even though House Arc has a footprint of less than 100 square feet, it's roomier inside, thanks to walls that bow out and 9-foot-high ceilings. The cozy mail-order home can also be added to a backyard to expand living space, say as a guesthouse. Or it could be used as a cabin in the woods. But the cost is still high, at a base of about $55,000. However, Bellomo wants to automate the production process, which should cut the price at least by half, he said. Options for the modular home include plumbing, ceiling fan and solar panels for the roof. At this point, customers would have to arrange for these installations themselves. Home is wherever you want it to be. 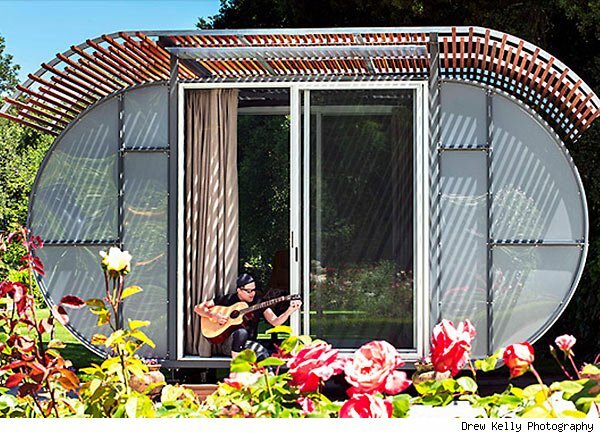 This 150-square-foot home can be shipped almost anywhere and then assembled like Ikea furniture in about four days. House Arc was created as an emergency shelter for disaster victims, but it could also be a cool guesthouse for the backyard. According to architect Joseph Bellomo, it can be put together on site by anyone who has simple carpentry skills in about four days. "We designed it to be a kit house that can be assembled quickly -- like prefab furniture," he said. Just as importantly, it can be easily disassembled and shipped to where it's needed again, he said. The curved structure of the House Arc allows for more space, light and air. For Bellomo, it was important that the modular home be attractive and comfortable, especially for those who may have lost all of their belongings in a disaster. Plumbing, a ceiling fan and solar panels can be added. The House Arc is designed to ship in a 3-by-4-by-10-foot container box, a lot smaller than the container Bellomo used to ship a prototype to Hawaii for a client. One house currently costs a hefty $55,000, but Bellomo hopes to slash the cost at least in half by mass-producing the units. Bellomo designed House Arc with an egg in mind. Eggshells tend to be strong because the curves distribute loads along the surface rather than concentrating the weight all in one place as they would be on a flat plane. Bellomo said House Arc can withstand high winds due to its tubular steel structure. His firm has worked with this material before, building bike shelters. "The connections are super strong," he said. "There are no wall-to-wall connections, which are inherently weak." House Arc is eco-friendly with a roof that can support solar panels for energy generation, windows that allow for cross ventilation, a shade trellis, and a raised floor that air can flow under and cool the interior. Bellomo said that it can be insulated to endure cold temperatures as well, making another potential use as a hunting cabin.